A few weeks ago, I was working on a sizeable video project, recording a Cuban music concert, using six cameras, a couple of sound recorders and at the early planning stages, it transpired that my crew are running low on reliable memory cards. When working on location, under live-show time constraints, it is crucial to be able to trust your gear and be well prepared to capture the whole thing. Getting the supplies – surprise! 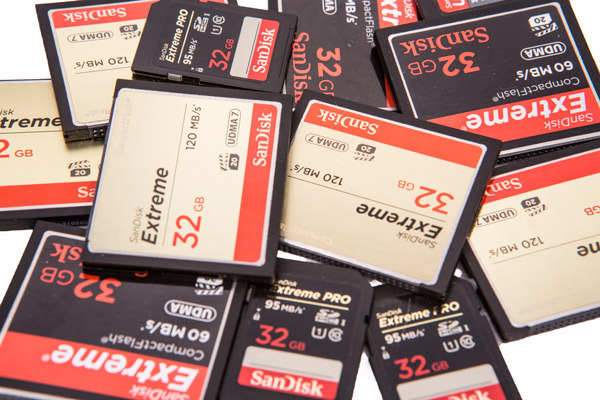 Off I went to my retailer of choice, in search of expanding my collection of SanDisk Extreme 32GB 45MB/s SD cards. I did not have to wait long for the delivery of 3, brand new. Imagine my woe, when testing the cards I noticed that they corrupt every video file longer than about a minute! Initially, I thought my camera was acting up, since the recording never stopped and no ‘buffer full’ icon was visible throughout recording. However, it soon turned out that the card contents cannot be downloaded onto my PC faster than about 10-11MB/s. Being accustomed to blazing fast speeds of 45-90mb/s, using a USB 3.0 reader, I knew something was wrong with the cards themselves. I looked at the order confirmation again and verified, to my disbelief, that it shipped directly from the supplier, not via a 3rd party, where one could envisage a slightly lower-than-usual product quality, at times. I looked at the listing and, to my horror, over 100 1-star reviews were reporting fake cards had been sold directly to customers. I immediately sought a replacement and within a few days, 3 new SanDisk Extreme cards found their way to me. No sweat, I thought… Until I tested them and, sure enough, all three were fakes. Running at 10MB/s read and write, corrupting files and misreporting actual capacity both to Windows and the camera. I dug a little deeper and found a piece of software for testing true card attributes, called H2testw – available on Softpedia. It soon confirmed my primitive testing. I raised a refund request and sought my cards from elsewhere for the time being. The ability to hire cards comes really handy when you are in a pinch! Meanwhile, I also raised a support ticket both with my supplier and SanDisk. Within the same day, the issue was filed and (allegedly) forwarded on to the relevant anti-counterfeit teams. I was also promised that the listing for the SanDisk cards affected would be taken down, but a few weeks on and it is still up there, so Buyers – Beware! Attempt to copy as much data onto the card as it should take (usually, a card will take slightly less than its stated capacity, depending on the manufacturer – this is normal) – if you are wondering what to copy – copy video or photo files you already have on your machine! If this test is successful, you are most likely a proud new owner of a solid, genuine card. Finally, if your card is made by a company worth its salt (like SanDisk or Transcend), you should be able to contact their support (via chat or email, for instance) and request a serial number check – within minutes you will have a definitive answer. This step is rarely necessary, but it is good to be aware of it.